We meet at "Shirahama conue noriba"
we get on the kayak. If you have request,please let us know. then you can be back to Ishigaki. You stay in Iriomote,we take you to your hotel directly. Avilable shower room(in front of the sea),you must bring your towel. After finishing tour,you can take a shower and change your clothes before you are back to Ishigaki. If you are staying on Iriomote,we take you to your hotel directly. You trek on the mountain road from upstream to Nahra waterfall for 40 mins. Nahra waterfall is 25 meters high,water pocket is large,you can jump into,stand under tha waterfall. Back way is same way,so we do not reccomend for person who is laid back. There is a large tidal flats with special ecological at low tide. We would like to stop by this place even in hard way. Also we would like you to have a break and look for nature as much as possible on the tidal flats,when you get off kayak. This treking route was made by Uminchu(fisherman) and rocal people in Shirahama in the late 1990s. Mansaku is proud of join that more than anything else. 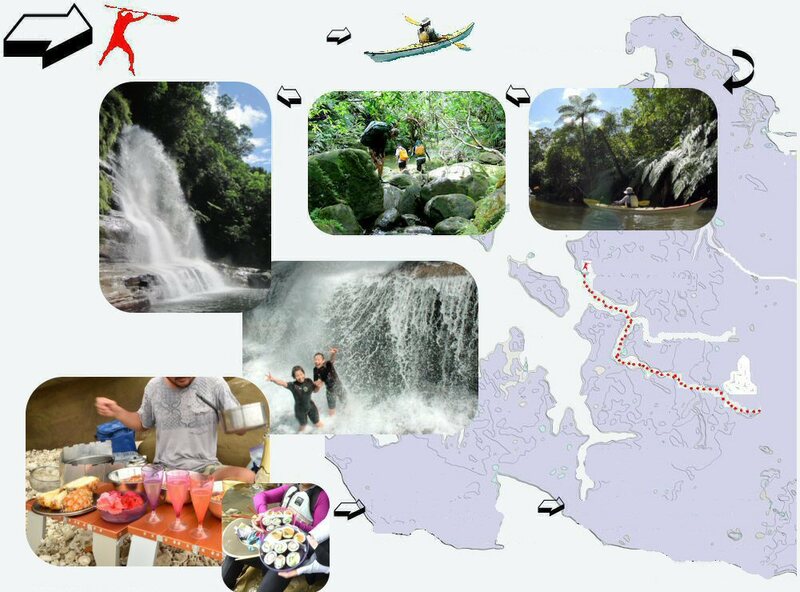 Before that,we could not go to the waterfall earsily thats why rocal people still call it "Legendary waterfall"
We support you from bigginer to family who has motivation for education of nature,the future and development of kayak. We would love to support you and this is our obligation. It is really hard on the way to the waterfall,but everyone gets used to puddle on the way back to here. Swim in the waterfall and had lunch makes me alive once again!it reminds me club team in highschool.